She was lying flat- eyes closed, flank tense and very quiet. As I got closer I could see lots of stressed hoof marks on the ground. Are you thinking what I am? It’s Windy. She was something in the day, but now she is 22 yrs old, with a suitcase of maladies. Like an old woman, she gets tinier each year. And she was in gut wrenching pain- literally. Is it the dreaded C. Word? I waited for the vet; I did the poop chant silently. Colic is my sworn enemy- the number one killer of horses, and its cause is still nebulous. It can be a weather change, a rapid barometer jump or a slow shift of season. Or a change of feed, or a trailer ride. Dehydration. Ulcers. Heat cycles. Sand. Horses have such a sensitive digestive system, the truth is that any change can do it. And he said there was some sand. Sand gets ingested from eating off the ground, which is pretty hard to avoid ultimately. 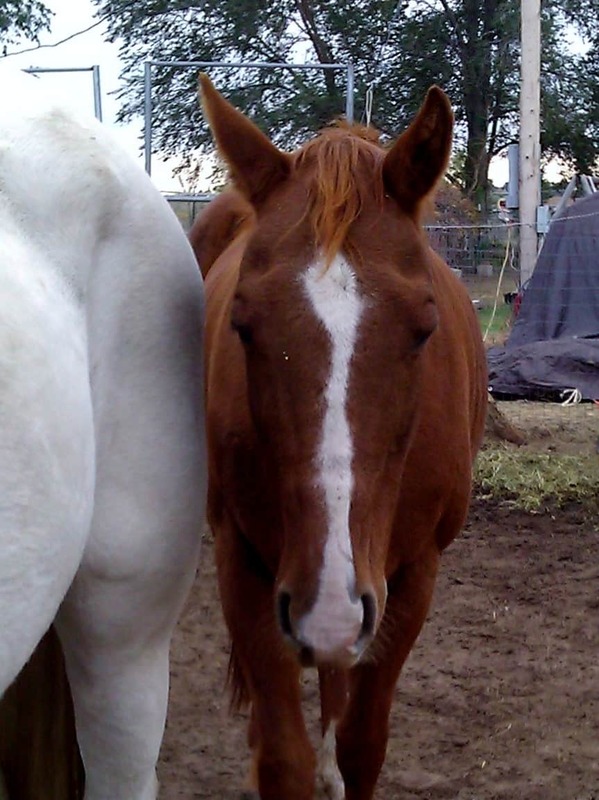 It’s especially common in older horses like Windy, and with the drought locally, there is more dirt and less grass. I know all this so I did a big psyllium supplement purge last month! Which apparently did not do the trick, we are on a month-long purge now. How is your psyllium supply? I optimistically ask about what’s new on the horizon for colic treatment. The vet told me that there are better tests now to tell sooner if your horse needs surgery. Quicker to surgery is good, but my sweet Windy is not a surgery candidate. Is your horse a surgery candidate? It’s good to decide while everything’s fine. If surgery isn’t right for your horse, you might practice saying it out loud, “My horse is not a surgery candidate.” Sometimes saying it is the hardest part. Windy’s result was good. The vet said it was a mild colic. (Doesn’t all colic start that way?) I continued the poop chant, but 24 hours passed with no result. She is cautiously okay now, but the colic took a toll- she is thinner, depressed and still very tired. On a separate but related note- yesterday morning I was driving to a lesson with a new client and thinking about writing this. My stomach was kind of twitchy. If I was a horse, you would call me stoic, I soldier on. The lesson went well, we talked about perception and the art of release. The rider had invited another potential client to watch. We were just finishing and… No! I threw up on her center line. I never do this, and it wasn’t even kind of graceful. It was really nice footing too. Awkward! Food poisoning? Flu? Or maybe colic and I am actually turning into a horse? Would that be enlightenment? My client asked if I throw up often, and I shook my head. And threw up again. I think her dog felt sorry for me. Horses and humility- it never gets old! I am fine now, but my old dog threw up all night. It’s an epidemic! We are expecting our first snow of the season on our Colorado prairie tonight. Maybe an extra walk-thru before bed to double-check the water and throw extra hay, with a special eye on the herd elders. Here’s hoping for a gentle winter. Our senior Arab died a year ago next week and yesterday as I was doing chores I thought to myself, “This is the exact same kind of weather … colic weather.” I also stopped to thank my lucky stars that both our remaining horses are still young and not showing any signs of being afflicted with this dreaded seasonal scourge. Yet. One of my dogs has thrown up several times a week since he was a puppy. He’s currently on the longest no-barf stint ever, (I probably just jinxed him) but two days ago he pulled up severely lame. Lyme? Twisted/sprained wrist? Who knows! As Rosanne Rosanna Danna would say, “It’s always somethin’!” Hope you and yours are on the mend soon! In Arizona the horses would colic on Mothers’ Day. Probably because that seemed to be the first triple digit day. In Pennslyvania it would be in the sweltering summer when neither temperature nor humidity gave us a break. I would second the wish for a mild winter except we so desperately need the moisture. Take care horses and people. Hope you and Windy are much better! Touch wood, my very colicky veteran is thriving, but I’ve just been prone for a few days with an attack of vertigo (lots of throwing up involved) – doc said there had been several local cases recently and it could be weather/air pressure related. I think the earth’s moods affect us in many more ways than we yet acknowledge ….. and I’m still staggering around like a drunken sailor!!! Thank you all for the concern about my minor ‘colic’. I have recovered from that… but the embarrassment of puking in public will take a while longer.